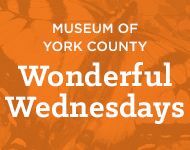 Meet at the Museum on Wednesday mornings as we encourage exploration and investigation of natural history topics with new exhibits, guest speakers and staff-led activities. Programs are recommended for children 6 years and older and their families. • Join our Curator of Natural History and Carolina Piedmont Naturalist, Dr. Steve Fields, as we discover the role that birds, bats and insects, especially butterflies, play as pollination partners. • Observe butterflies up close and personal. Our Butterfly Porch will be open from 11 am – 2 pm on Wednesdays. Schedule subject to change.